Organizations generally switch to cloud-based services to save money, but there are environmental benefits as well. Cloud computing reduces energy use and carbon emissions, according to Google, which claims that an average enterprise can lower its energy usage by 65 percent to 85 percent by switching to online productivity tools such as Google Apps. "Lower energy use results in less carbon pollution and more energy saved for organizations," writes Google's Urs Hoelzle, senior vice president for technical infrastructure, in a Monday post on the Google Green Blog. A typical organization has more servers than it needs for back up, failures, and spikes--an inefficient system that wastes energy and money, Hoelzle writes. 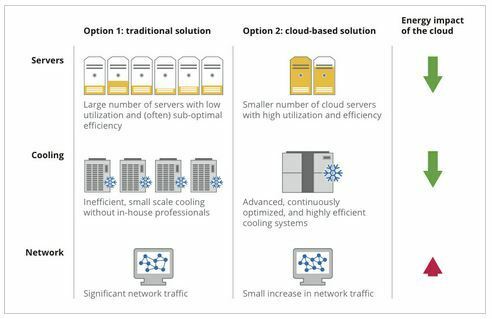 Cloud-based services, by comparison, are used far more efficiently by thousands of people, and are engineered to minimize energy output for operating cooling servers. How much energy and money can organizations save by switching to the cloud? According to Google, the U.S. General Services Administration (GSA) cut its server energy use by nearly 90 percent and its carbon emissions by 85 percent, when it recently switched 17,000 users to Google Apps for Government. As a result, the GSA will slash its annual energy bill by about $285,000. There are security issues with cloud computing, of course, and organizations must weigh the pros and cons before making the switch from in-house solutions. But the potential energy savings of using the cloud are crystal clear.